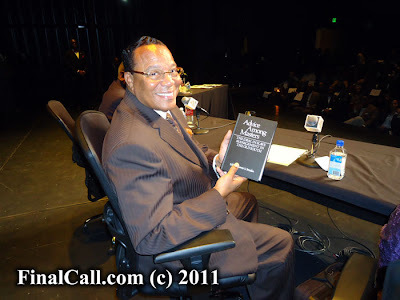 The Honorable Minister Louis Farrakhan is a man of impeccable character. It is one of the many reasons why he is so loved by Black people throughout the world and even by other nationalities, who value truth. People know that the Minister will not back away from speaking the truth regardless of whom or what. The media has attempted to make some believe that he only speaks out against the errant behavior of whites, but we have archives of his words that show that he is consistently the same where ever he is. For example, on the eve of the pending Desert Storm, the Minister and members of his delegation were in Iraq at a meeting held by members of the Iraqi leadership. They were calling for a jihad against America. The Minister was given a chance to speak. In the midst of this emotionally charged group, the Minister told them that their problem was not the U.S., but their deviation from the path of Allah! Such a stance contradicts the false image the Minister has been portrayed as. However the Minister did what he always does, stand on truth even during the most challenging moments. A great test of one’s character is how one responds to those who are sworn enemies. Many in leadership can learn a lot from the example of the Minister in this area. It’s no secret that members of the Jewish community want to see the Minister dead. Their hatred of him has caused them to forsake principles of character. They are the main architects of the intentional distortion of the Minister’s words. They violate the principle which Allah admonishes human beings to observe in Surah 5:8. Yet, the Minister in his defense against their attacks and threats on his life, still maintains his integrity. An example of this is seen in his letter written to Abraham Foxman, the head of the ADL. The Minister had the NOI Research team to research Jewish actions that have been contrary to the self-interest of Black people. He instructed them to be, “…very careful to omit any words written or spoken, no matter how truthful, by those who are considered “anti-Semitic.” How many critics of the Minister and the NOI have done this when they write about us? As Bro. Sharieff in Atlanta so often asks when testifying about the beauty of the Minster, “What manner of man is this?” My response to that is a Divine man of sublime character. He reminds me of what I read about the Angel Michael in the Book of Jude verse 9. The Arch Angel Michael was engaged in a fight with Satan over the body of Moses. Despite being in a battle with the archenemy of his God and the chief deceiver; Michael still battled Satan in a principle manner so says the scripture. “But even when Michael the archangel was arguing with the devil and debating with him concerning Moses’ body, he did not dare to bring a slanderous judgment, but said, “May the Lord rebuke you!” Simply, put Michael did not stoop low to defeat Satan. While studying the prophetic figure of Michael the Archangel, I found a connection between him and the Minister. The Hon. Elijah Muhammad once told the Minister, that he was an angel. He also told him that he had “only one Farrakhan” and “that he was a star without equal.” Michael’s name is a question, “Who will stand for God?” and he is the ONLY angel of God that wears the title of ‘archangel’, which means an angel ranked above the highest rank in the celestial hierarchy. The Minister is without question standing for God and His Christ in this terrible time and he is the number one student of the Most Hon. Elijah Muhammad.